In this study carried out between September-December 2008 and January-April 2009 fishing periods, a total of 89.03 km2 areas has swept and mean swept area is 0.13718±0.0006 km2 per trawl haul. On the swept area surveys performed at the Sinop-ÃÂ°nceburun region; annual, monthly and daily catch amounts of whiting (Gadus merlangus euxinus), red mullet (Mullus barbatus ponticus), turbot (Psetta maxima maeotica), shad (Alosa sp. ), picarel (Spicara mae-na), horse mackerel (Trachurus mediterraneus), shark (Squalis achantias) and goby (Gobius sp.) 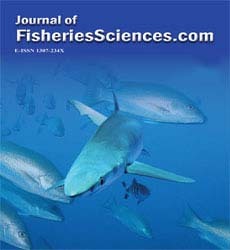 has determined and catchable fish biomass and stock size on the region has examined. According to results of the study, separately practiced for both of 2008 and 2009 fishing pe-riods, distribution of whiting, red mullet, turbot, shad, picarel, horse mackerel, shark and go-by has calculated 932.90 ±22.41 kgkm-2, 11.37 ±0.69 kgkm-2, 24.35 ±1.21 kgkm-2, 8.13 ±0.46 kgkm-2, 1.79 ±0.17 kgkm-2, 6.24 ±1.99 kgkm-2, 0.39 ±0.16 kgkm-2 and 4.11 ± 0.30 kgkm-2 respectively. Stock sizes of the species for 2008 and 2009 fishing periods has deter-mined 690.18 ±16.57 tons, 8.41 ±0.51 tons, 18.02 ±0.89 tons, 6.01±0.34 tons, 1.32 ±0.12 tons, 4.62 ±0.27 tons, 0.29 ±0.11 tons and 3.37 ±0.28 tons for whiting, red mullet, turbot, shad, picarel, horse mackerel, shark and goby, respectively.